with discounts offered for stays of 7 nights and longer. for our usual 6 night minimum required stay. Additional guests add a reasonable $10 nightly per child, and $15 nightly per adult. Large and Well Supplied Family Home, Perfect Location on a Beautifully Landscaped 1 Acre Lot. Large Pool, Hot Tub, and Great Views too! "The home has a great feel to it". Perfect for a couple that enjoys their privacy, a large family, or a few couples sharing expenses. The huge west facing (Sunsets!) covered lanai has an additional 650 sq feet of living space. It's like having 4 more rooms, and features the large Hot Tub, another seating and dining area, and a small Tiki bar as well. The lanai faces the large pool/sun deck with a 35 X 18ft pool, plenty of sun furniture and a BBQ area. Most all rooms open out to the Lanai and Pool Deck. The Home, Lanai, and Pool are all on the same level, and the home has an open floor plan, so it's great for spending time with friends or family. This is NOT a "bare bones" rental, it is well equipped, well decorated and well furnished. It will feel like your own place! Kitchen is large and VERY well equipped and has an additional bar/counter that seats 4. The inside and outside dining areas each seat 6, plus 6 more at the pool-side umbrella table. This home has many extras you would not expect in a Vacation Rental! 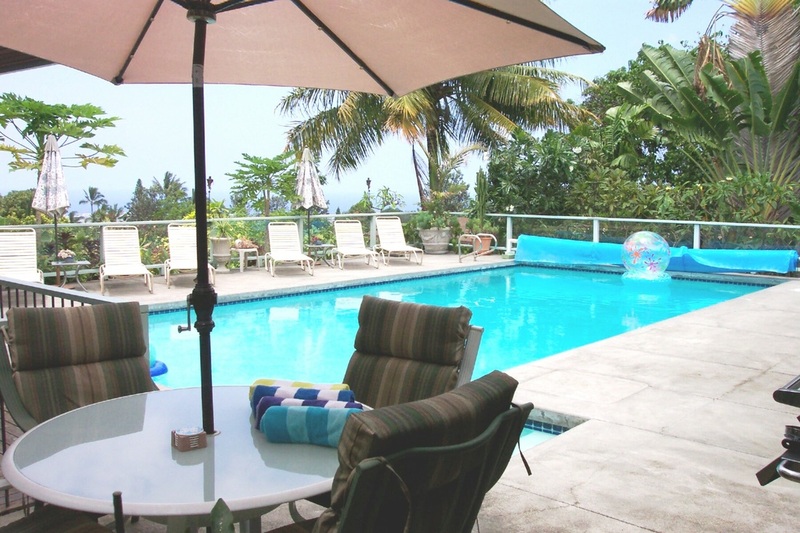 Many other extras provided with this home, beach equipment, coolers, assorted snorkel gear, and boogie boards too! Also a nice assortment of family / children's games and Movies. This home includes: local phone, secured WiFi Internet for your Laptop, Cable TV (3), VCR, Stereo, Blueray Player, Full Kitchen with many extra appliances, Microwave, stove/oven and an additional toaster oven, Dishwasher, large Refrigerator w/freezer & Ice Maker, additional mini fridge on Lanai, Blender, Coffee Maker & Grinder, Spices & Condiments, barware, all cookware, utensils, and sundries, Ample Towels and quality Linens, Laundry Room with Washer & Dryer, laundry supplies, and Gas Grill. We also include pool floats and toys, family games, puzzles and books, and many baby / infant items. We strive to provide everything you would need. This home is strictly a No Smoking home! You will feel like you are visiting a friend's home! Weekly Pool and Spa maintenance is included free of charge, pre-arrival grocery shopping available at cost. You will be worry free here, the property managers cottage is located on the lower 1/4 of the 1 acre property. They are quiet and respect your privacy, but are there for any questions, directions, or advice you may need!